As usual my life has been interesting lately. With the advent of Spring, I started spending more time outside. So I am doing less art/craft type things. The project I am working on right now is private and will never be shown on my blog or facebook - so blogging has been put on the back burner. Let me give you a gentle but firm warning. Because of the mild winter - at least here in the South - there are lots of ticks and other insects. How do I know? I mentioned spending more time outdoors. One evening I was sitting inside and I had avoided starting to use air conditioning so I was wearing gym shorts. I rubbed the underside of my left leg and felt a small bump. It felt like something was stuck on my leg, so I picked at it. When I got hold of it, I pulled it off. Yikes, a tick. Honestly, I have found ticks on myself before so it didn't worry me. I smashed it and carried on. A couple of days later a friend said "Let me look at your leg. What happened here?" and I told him about the tick. He said "You need to have a Doctor look at that." I took a picture with my cellphone and saw that it was a round red area with a center spot. So - fast forward. I went to the Doc, got antibiotics in case it may have been infected with Lyme disease. Needless to say, I haven't been doing a lot of outdoor tromping about since then. I need to round up some 20% DEET repellent spray. As you know, blog posts are not nearly as interesting without pictures so I am adding a couple. Loopy fringe made using a method I learned recently. It isn't attached to anything - it is some I made to use for embellishment. 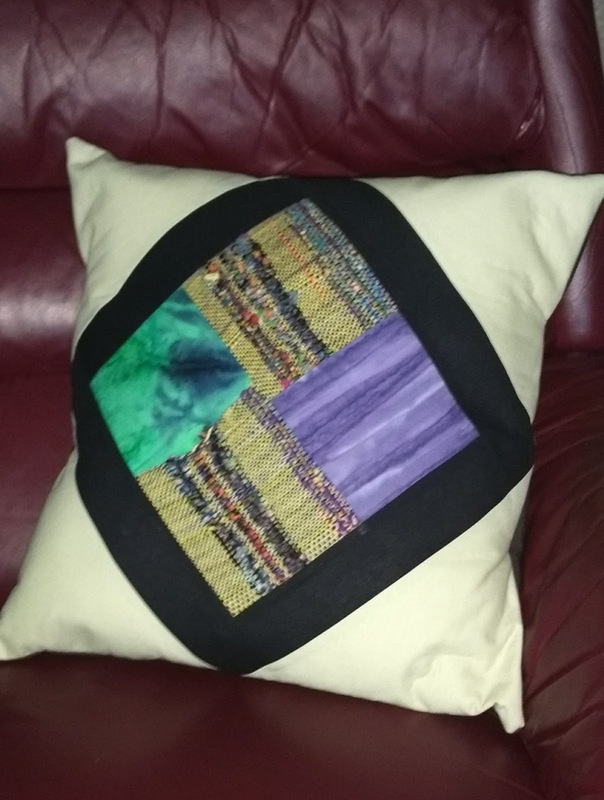 My art/weaving/quilting website has been updated a few times in the past couple of weeks also. The fringe embellishment is very pretty. Is this part of the secret project? If not then I hope you share what you will attach it to. Hope your leg heals quickly. I'm off to check out the new website. Exciting. Yep, lots of bug spray! I have it on all the time when I'm outside because my blood seems to be particularly tasty to mosquitoes. They must know how much chocolate I eat! Tick bites are scary things.....lots of spray. I love the fringe! Ugh. Ticks! They give me the creeps. We had a dog get one in the middle of her forehead. For a few days we thought she was developing a mole. But when it got to the size of a plump raisin I took a closer look and realized what it was. You probably know that pulling a tick off is a bad thing to do since the head of the tick can be left behind creating an infection. I'm so glad you had a doctor check it out and test for Lyme disease. Ouch!! I hope you're ok. My husband just sprayed our back yard a couple days ago with some kind of bug killer. Had to keep my granddaughter off it for a few days. We get deer hanging around a lot, so now that our granddaughter is a toddler and loves to run, he decided to spray. Hopefully it will take care of the ticks.